And fabric.com is my latest dealer. I took advantage of their big Independence Day sale and ordered several fabrics. 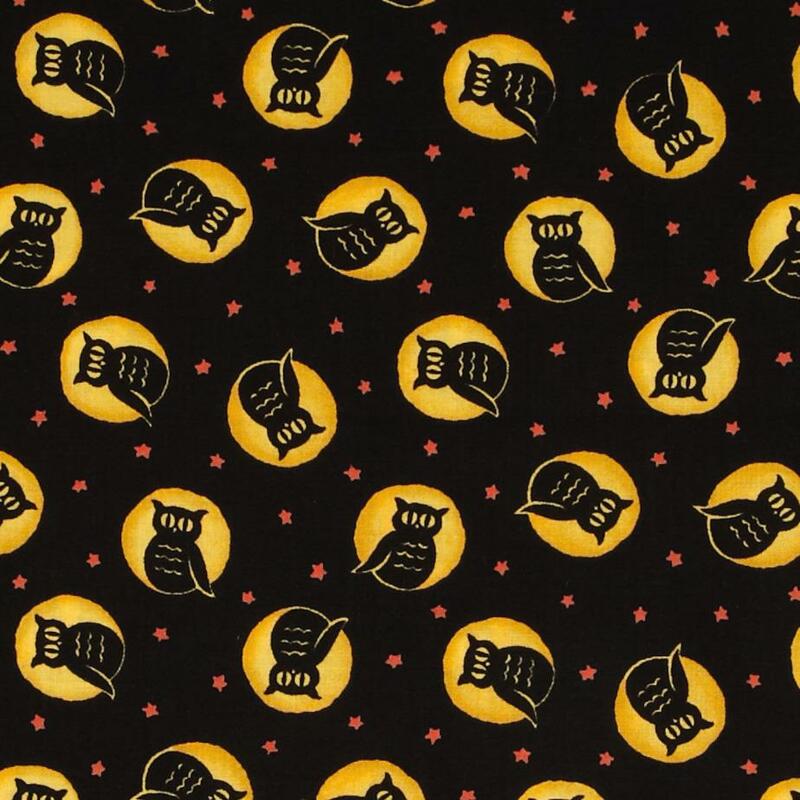 A cute Halloween fabric; black with black owls and yellow moons. 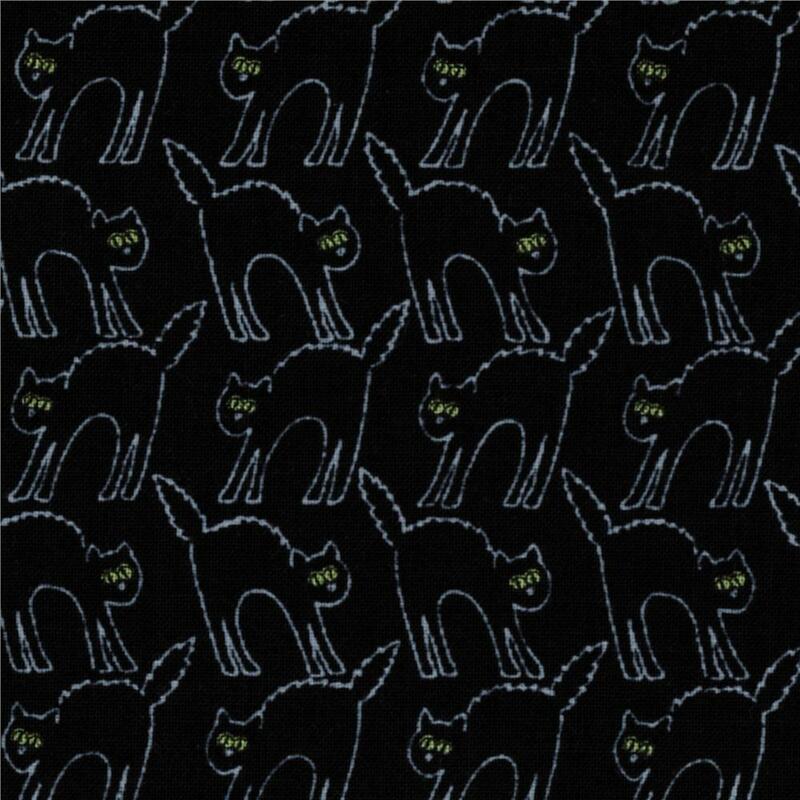 A black fabric with cats. This is a smaller print and more subtle than it looks in the sample. Skeletons on an off-white ("bone") background. This one has an old parchment type of look. Goth cupcakes. This one was too kitschy to pass up. A print of ravens, skulls, etc. on a dark red background. I didn't pay close attention to the ruler at the bottom of the sample, and the print is much larger than I expected. The raven in the center is 7.5" tall, for example. Makes for a very bold fabric! A collage of Edgar Allen Poe-inspired images. I wasn't sure if I would really like this one because I'm not a fan of golds and browns, but turns out I love it! It's a big, detailed print, and the colors are much richer and more complex than they look in the sample. Michael Miller fabrics have a good reputation, and now I know why. An Edgar Allen Poe-inspired print on a script background. This one also looks much nicer in person. The sample appears almost monochromatic, but there are actually hints of purple, brown and gold. The print is very impressively detailed. I love this one! A print with various scenes of odd characters. This one is so great, it makes me squeal with delight! A print with the odd characters. I love this one! What do you think? 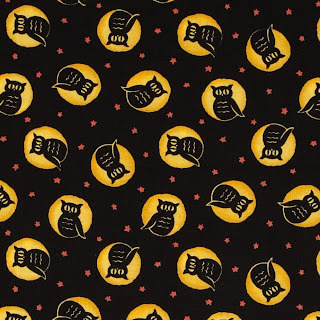 If you were going to have something made in these fabrics, what would you want? Egads, what a great haul! I have the same problem. So many projects, it's hard to stay focused sometimes! I rarely use large prints; in fact, I don't think I've ever used one as large as the red raven print. I'm a bit stumped as to what to do with it. Depends on how much you have, but why not cover a wall or cut out a piece and frame it as a picture? Seat covers are also an option for larger prints, or is there enough to cover a piece of furniture like a footstool, or even a chair? There's always the possibility of table/ mantle runners, drapes, and canopies, depending on how much of it there is. the fabrics with small patterns would fit nice for a dress. the others for skirts or maybe for some interior projects. They are lovely all of them. 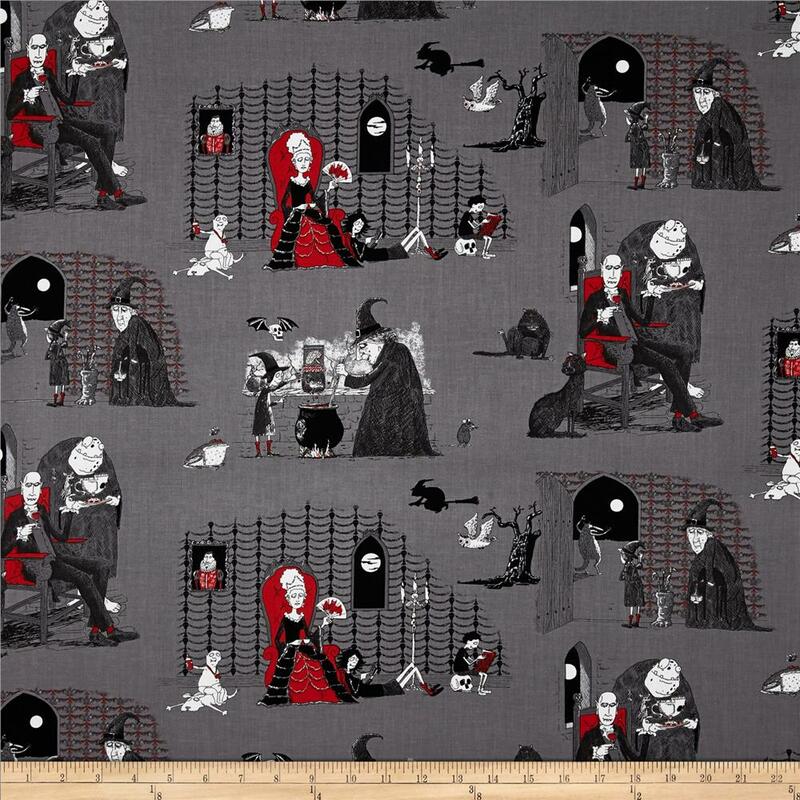 The oddities fabrics reminds a lot of Alexander Henry's the Ghastlies, or is it perhaps an Alexander Henry design? I, too, thought of the Ghastlies when I saw the Oddities fabric. The designer wasn't listed on fabric.com, so I checked the manufacturer's site and learned the designer is Andrew Pinder. So many wonderful fabrics!!! 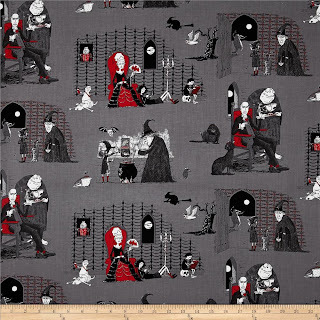 I've seen the Michael Miller Nevermore fabric made into a dress and I thought that was darling. I know you've struggled with dresses, so perhaps a skirt or bloomers! 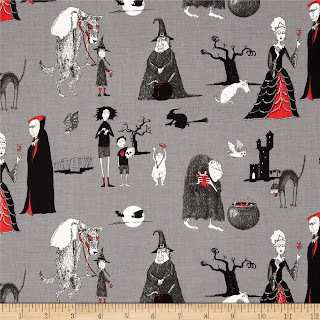 I think the white Nevermore fabric in particular would make a great summer dress. But yeah, I might stick with a skirt. 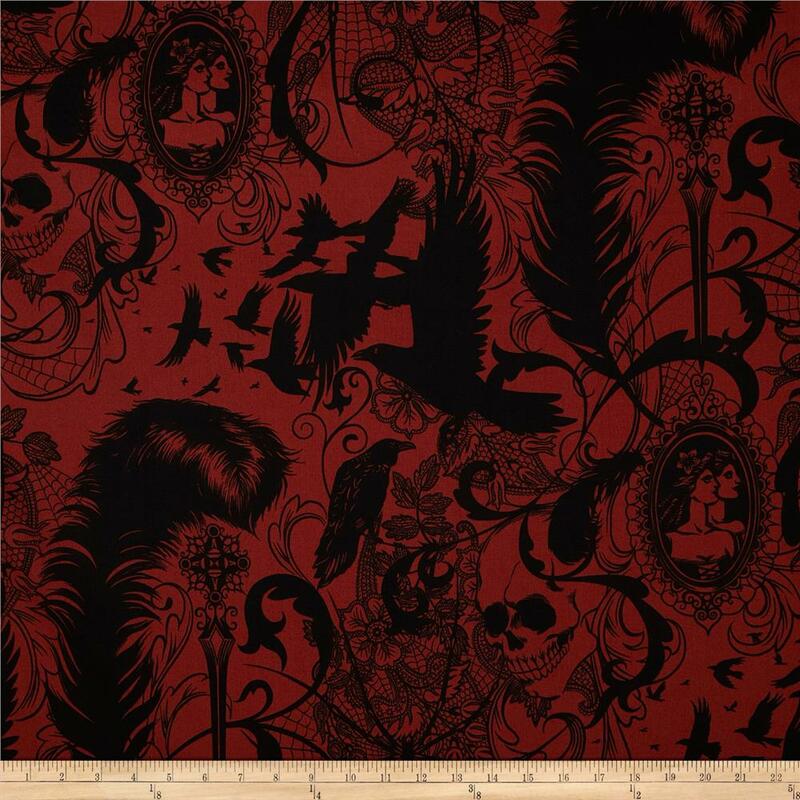 I have two other prints from that Nevermore collection that I've been meaning to make into a dress and bolero. 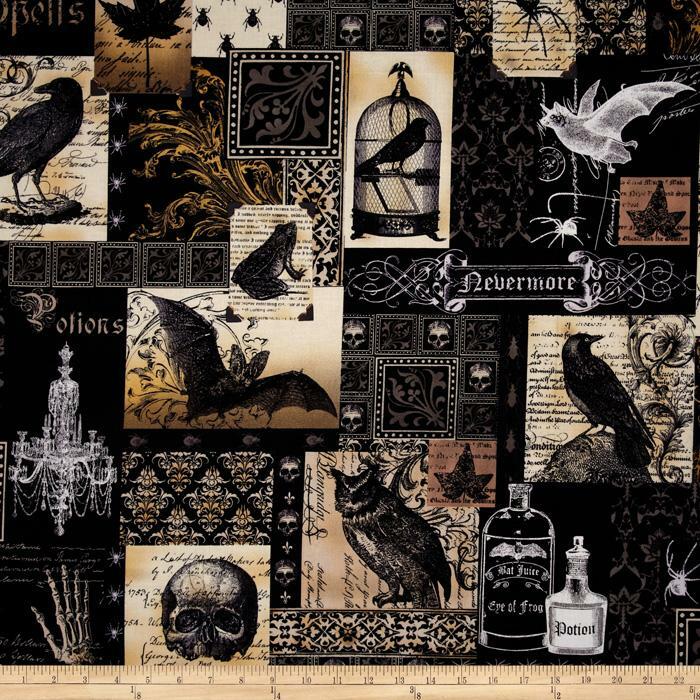 My answer for Halloween fabric is almost always to turn it into a dress, but I bet those Nevermore prints would make nice curtains. I have to admit, I think I'm to blame for that... 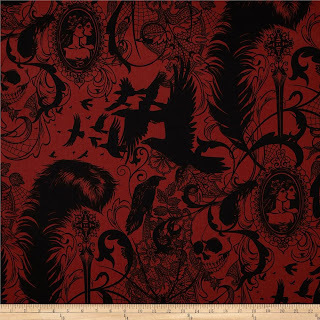 The website showed just two yards of the red After Dark available when I placed my order. :/ I have seen it for sale on other sites, though, including etsy. Ah poo! I missed their sale. :( I was going to order the goth cupcakes and the after dark, so sad it's sold out. Good snags, my friend. EXCELLENT. They almost always have some type of a coupon on their "Coupon Corner" page. Often it's a 10% off coupon. I'm loving the Sleepy Hollow Skeletons! And I have 10 yards of the Nevermore Collage - it's my favourite! I'm hoarding it for something special, although I don't quite know what that will be yet. I just met Mme. Polaire in Vancouver over the weekend and she was wearing a dress made from the Nevermore Script. It really looked fantastic. 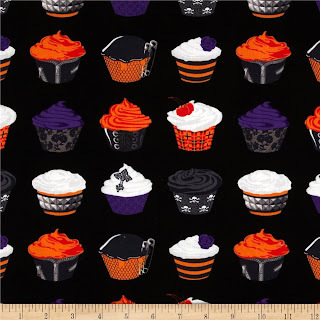 I think the cupcake fabric would make a great apron and potholders in your nice new black kitchen. The icing goes with your purple toaster!! The Collage fabric is so nice, I could see just framing it as wall art. Alas, it doesn't match anything in my entirely cool color-decorated house. Maybe an apron and potholders would encourage me to actually do some cooking. Nah... probably not. :P But they would look fantastic! 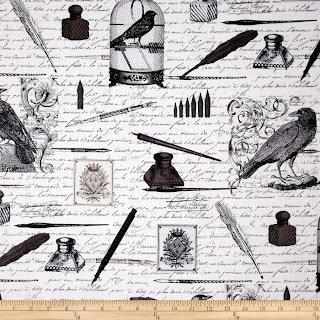 Oooh, I love the skeleton print and the Poe one with bats. How about trying to make a fabric pencil/makeup case? I might try my hand at a case. I have some zippers in my stash. I love the skeleton one and the After Dark one and I still kinda want the Nevermore fabrics, I guess I can save up for some more. Noooo Posts like this are so bad for me, I am addicted to fabric too! I have a couple of shelves full already!!! Love the nevermore and skeletons. I am thinking napkins since mine are like 20 years old. The oddities are adorable. Ooh, that's a good idea. The skeletons would make a cool table setting with napkins and placemats. 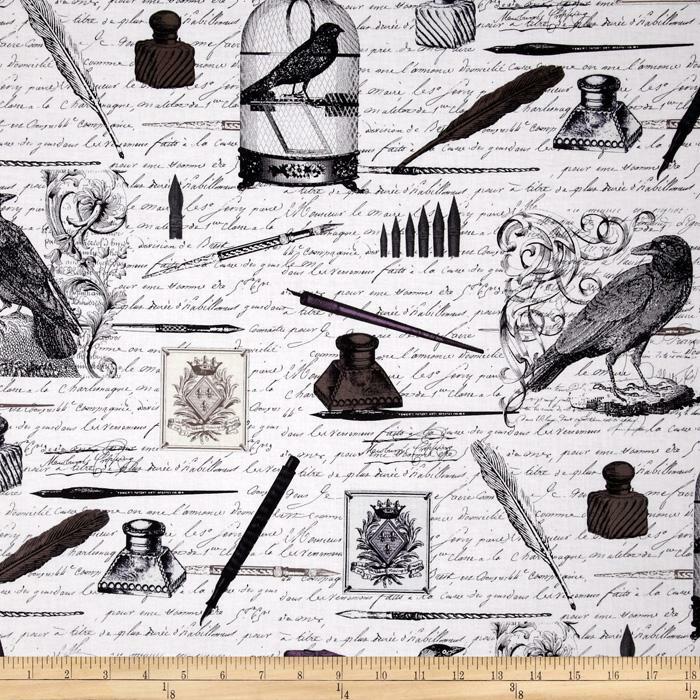 Just ordered the nevermore old script! Can't wait to make new napkins! I think the cupcakes would make cute scrubs or PJ pants. And they price their fabric by the yard, not by the half yard like some annoying shops do. Maybe I'm a cynical old grump, but I think half-yard pricing is just a gimmick to trick people into buying what they think is discount fabric. 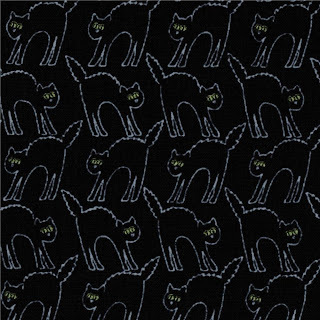 If you have access to Joann Fabrics, they're starting to receive their Halloween prints, which will get discounted to 30% off on Sunday (I had some coupons I used today...) True, they're not always the best quality, but there are some nice prints this year (and my local store had a few of last year's prints left in the clearance section...) All this year's prints are in the Halloween section of the Joann site now, too. 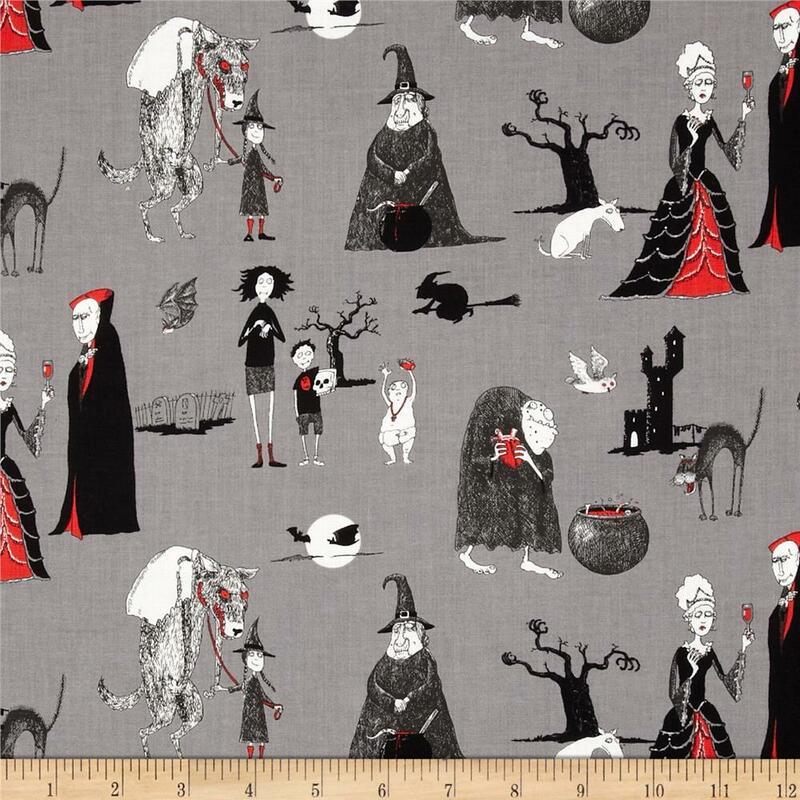 (No, I'm not being compensated by Joann fabric, just spreading the word...) When I was getting my cloth cut today, the fellow at the cutting table commented on how some the Halloween prints sell out fast each year. "Well, yeahhhh," I thought. Dammit! Now I have to go to JoAnn today! ;) They didn't have their new Halloween fabrics in the last time I was there (about a week ago). I have easy access to JoAnn... maybe too easy. There are two stores within a 15-minute drive from my house. 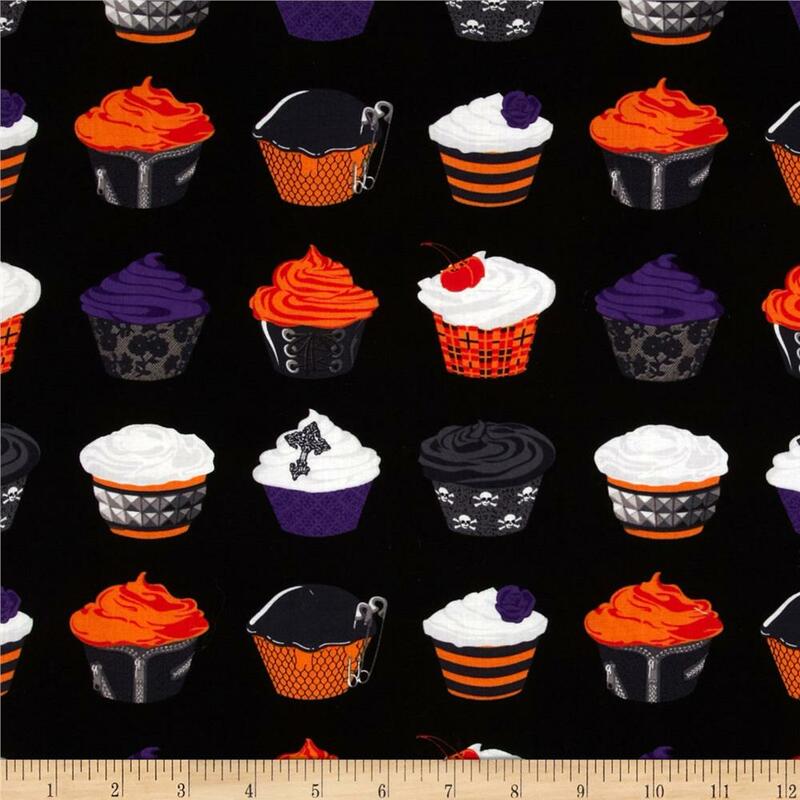 One stocks the basic Halloween fabrics year-round. I would try making a vest. Maybe a table cover. Oh! 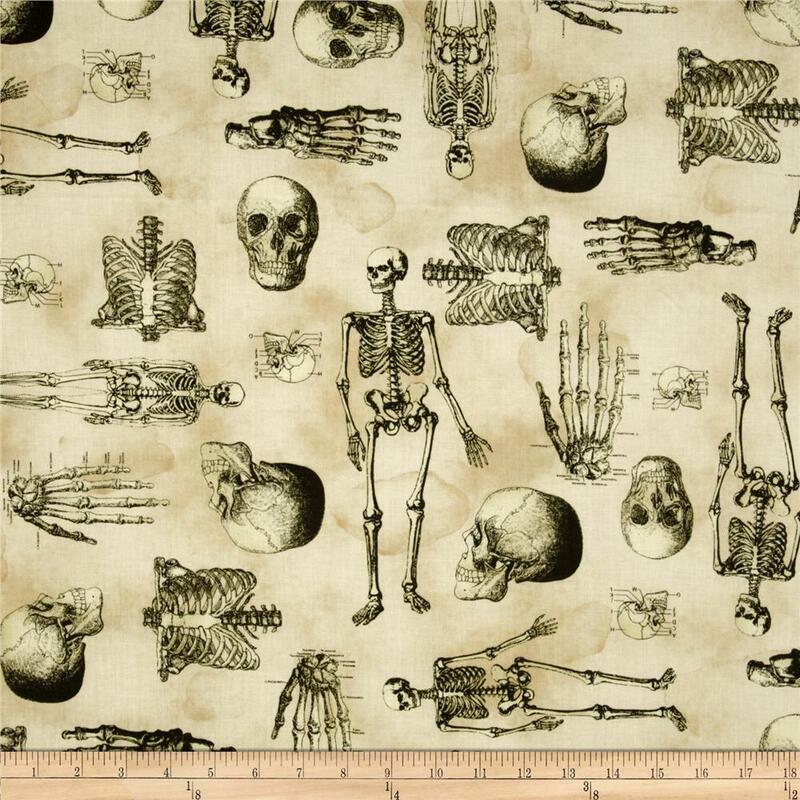 That parchmenty skelly print! I am in LOVE!!! I have GOT to get to my stash and practice practice practice!!! I picked up "One Yard Wonders" at garage sale a bit ago. Maybe between that, youtube, my other "how to" book, and frantic calls to Mum I can get to the point where I able to snag some lovely fabric like that and make something presentable!! Your stash has GOT to be awesome to behold. It's all about practice and patience. I've also learned a lot from various "how to" books that I checked out from the library.